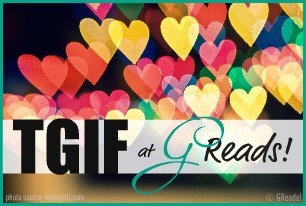 This is the awesomest blog hop hosted by Parajunkee and Alison Can Read. This week’s blogs to follow are Melannie @ Books Are Vital and Hannah @ Once Upon a Time. Yes, I’m a hoarder. I’m actually lucky because books I get for review are in their greatest majority egalleys of sorts or ebooks, but every once in a while there’s gonna be one author or publisher that wants to send me a physical copy, and despite the fact it takes it like 10 days for it to arrive to me, and a few hours for me to pick up from the outside-EU-mail post office, I cherish each one of those books. The fact they’re few is actually conductive to me still being able to move around my room, because I’d definitely keep them all if I have just 1 copy of them. Of course, if I have 2, I’ll probably give one away, but it’s a rare occurrence. The ebooks I hoard like it’s nobody’s business, I have zounds of them already. If I’m buying a book, I’m most likely to buy the ebook version even though I read them on my PC, because of a several reasons; the first and foremost reason is ebooks can be stored without much issue, the second is they arrive to me immediately while for a paperback I’d have to wait a week or more (not big on waiting, lol), and thirdly they are a bit cheaper then physical copies and when you’re a bookaholic and all it helps to get a deal on your addiction. And I’m delighted to have them ebooks, I spend time to organize them by author in folders, by language in each author’s folder, that sort of stuff. I’m a slight OCD case so it’s like nirvana for me to have all these files to organize and obsess over. I’d love to swap books maybe, but I don’t have much of a reading group where I live; it’s wrong to get attached to objects and all that, I know, but I mean, I form a relationship with that book, I hold in my hands as it unfolds its wordly secrets…and then I’m supposed to what, forsake it, abandon it, send it away? Sorry, no can do. And since physical copies are the rare case, I can afford to keep all my bookish lovelies right beside me. What would I do if I’d have a lot of them? Get creative about storing them, most likely. Most Popular: What blog post has gotten the most comments/activity on your blog this year? It is relevant because the entry was gained by filling a Google form, not commenting on the post or following me or anything like that, so people commented because they wanted to 😀 Which is awesome! The fact that many of the top viewed pages are meme and blog hops makes sense to me, though the numbers are again surprising comparing with the number of comments they get; I must be doing something wrong if so many people read them compared to how many actually reply to them, right? And yes, my utilitarian ‘pages’ are really posts, I’ve been meaning to make them pages for such a long while now, I think I should figure it out. When I did the blog it was sort of in a rush, so I didn’t spend a lot of time on that planning part of it, I just grabbed as much content as I could from Google Cache from my old blog or I would have forever lost that info and I would have hated that. What about you? Which of your posts draw out the most comments? Are they usually a certain type of posts (share the secret, lol), or not necessarily?